The growth of the AXE brand is driven by innovation. New scents, new formats, new SKU’s. To convert product innovation into market share success, product trial is absolutely critical. 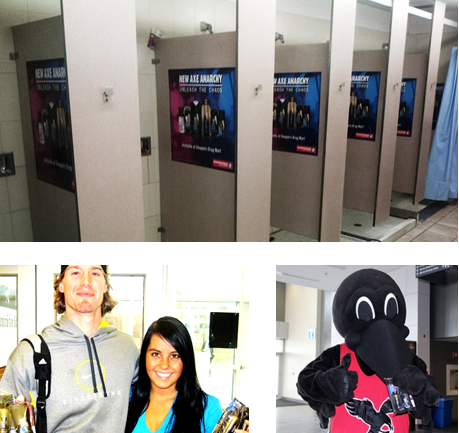 Over the past number of years, CI has been retained to execute an array of on and near campus sampling campaigns. To support the AXE Apollo campaign, we leveraged our campus athletics network to secure sample distribution via Campus Athletic Centres. As students entered the facility, they were handed an AXE Apollo kit containing deodorant, shampoo and fragrances. Given the highly contextual environment, sample usage was at an all time high with students using the samples within the Athletic Centre change rooms almost immediately after receiving them. AXE continues to leverage our Campus Intercept network to maintain a highly targeted and contextual sampling outlet.